Just as a warning, with a ten minute time limit and multiple matches in one night, some of these matches will be really short. Also, keep in mind that if both wrestlers in a match are eliminated, their opponent in the next round gets a Bye, so we may not get the full slate of matches as there will no doubt be a Draw or two along the way. Lizzy Styles was originally in the tournament, however she had to return home to attend to a personal situation (which I am assuming was her sister giving birth, judging by Styles’ Twitter). That left an open spot, so Stardom decided to have the winner of the dark match get an immediately shot to enter the tournament! Easy enough solution. Even though its a tag team, only one person can enter the tournament of course, so it will be whomever gets the pinfall or the submission. Yoneyama is the favorite here as she is the veteran, however anything can happen in these early matches. Azumi and Starlight Kid begin and trade wristlocks, they then exchange elbows but both miss their dropkicks. They tag out, Yoneyama avoids Nishina’s charge as Azumi comes in and they double team Nishina. Nishina and Yoneyama trade elbows, Nishina avoids Yoneyama’s charge this time and she hits a dropkick. Face crusher by Nishina and she hits a dropkick, covering Yoneyama for two. Nishina tags in Starlight Kid, Starlight Kid tries to dropkick Yoneyama over but is not successful. Drop toehold by Starlight Kid and she hits the Tiger Feint Kick, Shiranui by Starlight Kid to Yoneyama and she covers her for two. Starlight Kid tries to slam Yoneyama but Yoneyama reverses it and tags in Azumi. Azumi and Starlight Kid trade elbows until Azumi hits a dropkick, vertical suplex by Azumi and she gets a two count cover. They trade quick pin attempts with no luck, standing moonsault by Starlight Kid and Nishina runs in with a Somato to Azumi. Starlight Kid goes to the second turnbuckle and hits a diving body press, but Yoneyama breaks up the pin. Yoneyama stacks Nishina and Starlight Kid on top of each other and drags Azumi to her corner so she can tag in. She does so, Northern Lights Suplex by Yoneyama to Starlight Kid and she gets the three count! Yoneyama wins the match and is in the Cinderella Tournament! About as good as one can hope for from a four minute opening match. The concept made no sense, if only one wrestler could go on in the tournament, why would a wrestler ever tag out or even allow their own teammate to attempt a pin? Probably should have been a four way. But the action was fine and the ‘right’ wrestler won since Yoneyama probably deserved to be in the tournament in the first place. This match is in the Cinderella Tournament and has a 10 Minute Time Limit. We kick off the official tournament with two rookies colliding! Kyouna and Anou have pinfalls over each other since the fall, however Kyouna is slightly higher ranked as she is a Stardom trainee and has had the most success overall in the most recent crop of rookies. She is also larger than Anou, so she will be a bit harder to throw over the top rope, giving Kyouna another advantage. Kyouna has a new outfit, so you know that she means business. She attacks Anou right from the start and stomps her into the corner, she goes for a body avalanche but Anou moves. Anou and Kyouna trade elbows, dropkick by Anou and she hits a shoulderblock. Anou starts working on Kyouna’s leg and puts her in a figure four leglock, but Kyouna makes it to the ropes. Sidewalk slam by Anou, but the cover gets two. Anou goes for the fisherman suplex but Anou blocks it, sunset flip by Anou but Kyouna kicks out. Anou goes off the ropes but Kyouna hits a shoulderblock, lariats by Kyouna and she gets on the top turnbuckle, but Anou recovers. Anou tries to push her off and over the top rope, but Kyouna blocks it so Anou hits her rolling fisherman suplexes instead for a near three count. Anou picks up Kyouna and slaps her, she goes off the ropes but Kyouna catches her with a lariat. Kyouna slams Anou, she goes up top and she nails the diving body press for the three count! Jungle Kyouna wins and advances in the tournament. This match is in the Cinderella Tournament and has a 10 Minute Time Limit. Alex Lee is one of the most frequently used Freelancers in Stardom, as she appears on just about every show. Garrett holds the Wonder of Stardom Championship, but rarely actually wrestles in the promotion due to her commitments in the United States. Garrett is also the last person to pin Io Shirai in a singles match, so even though she is not around much, she is held in high standing in the promotion. After some quick limb work, armdrag by Garrett and she dropkicks Lee to the mat. Lee comes back with a superkick, she snapmares Garrett and kicks her hard in the back for a two count cover. Kicks by Lee in the corner and she hits a scoop slam, another slam by Lee but the pin gets another two. Lee applies a short armbar but Garrett gets to the ropes, Lee goes for a suplex but Garrett knees out of it and elbows Lee against the ropes. Irish whip by Garrett and she hits a lariat, another lariat by Garrett and she hits a side Russian leg sweep. Space Rolling Elbow by Garrett, Lee hits a few knees but Garrett kicks her back to the mat. Lee avoids the superkick and hits a high kick of her own, cover by Lee but it gets two. Lee gets on the second turnbuckle but Garrett avoids the missile dropkick, superkick by Garrett and she nails the Shining Star Press for the three count! Garrett is the winner and advances in the tournament. Not a whole lot to this one, they kept the pace up but since it was a sub-five minute match you would expect that. The action was fine and the right wrestler won, since Garrett holds a title they needed to get her out of the first round, and Lee was a safe person to beat since she is an opener wrestler. Not a bad watch but nothing exciting or memorable about it. This match is in the Cinderella Tournament and has a 10 Minute Time Limit. Yoneyama is back with her second match of the night, after earning her spot in the tournament in the opener. This is a bit of an interesting dynamic as it is two long time veterans facing off in a rare singles match, of course under the circumstances it will not be a normal match. As the leader of Oedo Tai, Kimura needs a win here or it may look bad for the faction as a whole. Yoneyama attacks Kimura from behind and hits the Chaos Theory, but Kimura kicks out of the pin attempt. Yoneyama tries more quick pins with no luck, kick to the head by Yoneyama but Kimura catches her with a choke. Yoneyama gets out of it by pushing off the ropes but Kimura quickly applies a sleeper, Yoneyama rolls out of it and she knees Kimura in the back of the head. Knee to the face by Yoneyama, and she covers Kimura for a two count. Big boot by Kimura, she goes off the ropes and hits another big boot, but Yoneyama bridges out of the pin. Yoneyama goes off the ropes but Kimura catches her with another big boot and picks up the three count! Kimura wins the match and advances in the tournament. This match is in the Cinderella Tournament and has a 10 Minute Time Limit. Another unique pairing, one of the good things about the tournament is we get to see some singles matches that we may not see otherwise. Hojo is of course the Pirate Princess and one of the fan favorites to win the tournament, as she tries to break out of her slump. 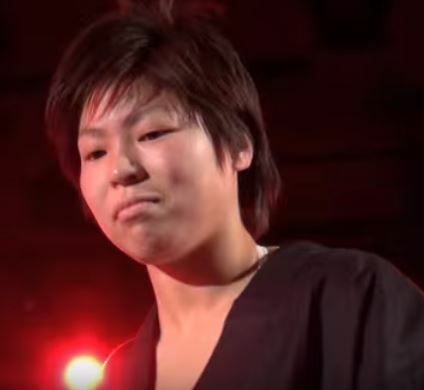 Watanabe will not be easy to defeat however, even though she just turned 16 she has proven to be able to hang in there with the best of them, and with the tournament rules anything is possible. They both go for dropkicks to start the match with no luck, Hojo stomps Watanabe down in the corner but Watanabe comes back and connects with a dropkick. Camel Clutch by Watanabe, she picks up Hojo but Hojo blocks the suplex. Hojo and Watanabe trade elbows, Hojo chops Watanabe to the mat and she covers her for two. Hojo chops Watanabe into the corner and she hits a running shoulder tackle followed by a neckbreaker for a two count cover. Crab hold by Hojo, but Watanabe crawls to the ropes and forces a break. Hojo stomps on Watanabe’s back and gets on the second turnbuckle, but Watanabe shakes the ropes and dropkicks Hojo out of the corner. Missile dropkick by Watanabe but Hojo avoids the Somato, elbow by Hojo but Watanabe returns fire. Watanabe ducks the rolling chop and hits the rolling vertical suplexes, cover by Watanabe but it gets two. Somato by Watanabe, but Hojo barely kicks out of the pin. Hojo clubs Watanabe and connects with the spinning chop, Irish whip by Hojo and she delivers the spear for two. Backfist by Hojo, she goes up top and she nails the diving elbow drop for the three count! Hojo is the winner and advances in the tournament. This match is in the Cinderella Tournament and has a 10 Minute Time Limit. A similar theme to the last match, as they pair a rookie against one of the members of Threedom. Iwatani comes into the match with two titles, while Mimura hasn’t picked up any wins of note in her young career, so she definitely has an uphill battle. While a pin is unlikely, an over-the-top win is her best hope of moving on in the tournament. Mimura dropkicks Iwatani before the match starts to get the quick advantage, small package by Hiromi but it gets a two count. Iwatani briefly takes back over but Mimura rolls her up a few more times, but she isn’t able to secure a three count. Iwatani kicks Mimura but Mimura fires back with elbows, Northern Lights Suplex by Iwatani but it gets two. Iwatani goes to the second turnbuckle but Mimura avoids the footstomp, roll-up by Mimura but it gets two. Elevated DDT by Mimura, she gets on the top turnbuckle and she hits a diving crossbody for two. La Magistral gets a two as well, Mimura goes off the ropes but Iwatani catches her with another suplex. Hard superkick by Iwatani, she gets on the second turnbuckle and delivers a diving footstomp for two. Iwatani goes all the way up this time, she hits the frog splash and she picks up the three count! Iwatani wins and moves on in the tournament. Perhaps a step down from the last few matches, however part of that was by design. Mimura kept trying for quick pins, which is a smart way to go about it but isn’t quite as much fun to watch as a back and forth match. Iwatani was bringing the pain here, with a really stiff kick and the footstomp, so clearly she wasn’t messing around. A fun quick match, but it didn’t click as well as many of the others in the first round. This match is in the Cinderella Tournament and has a 10 Minute Time Limit. Matsumoto was my pick to win the tournament, however I am a big fan of Kagetsu as well. Kagetsu is the newest member of Oedo Tai, and has the posse down at ringside to help her as needed. Matsumoto of course is one of the top Freelancers in Joshi and rarely gets pinned, so Kagetsu will have to reach into her bag of tricks to get the win here. Kagetsu attacks Matsumoto before the match (recurring theme for underdogs), she tries to throw her over the top rope but Matsumoto holds on. Matsumoto fights off Act while hanging there, she pulls Kagetsu onto the apron with her and gets back in the ring. 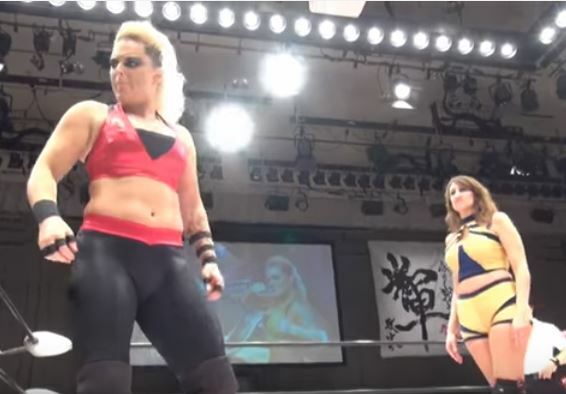 Kagetsu hops back into the ring and applies a small package, but it gets two. Kagetsu and Matsumoto trade elbows, which Matsumoto gets the better of, she goes off the ropes but Kagetsu delivers a dropkick. Kagetsu pushes Matsumoto into the corner and hits a jumping elbow, missile dropkick by Kagetsu and she puts Matsumoto in a cross arm submission. Matsumoto reverses it into an elevated crab hold, but Kagetsu gets into the ropes. Matsumoto gets Kagetsu on her shoulders but Act helps from the apron, Kagetsu applies a schoolboy but it gets a two count. Samoan Drop by Kagetsu, she picks up Matsumoto but Matsumoto gets away and rolls up Kagetsu for two. Backdrop suplex by Matsumoto, but Kagetsu barely gets a shoulder up. Kagetsu gets a bat and tosses it to Matsumoto, the referee tries to take it from her which gives Kagetsu time to connect with a high kick. Kagetsu gets the bat but Matsumoto blocks it when she goes to hit her, Matsumoto throws the bat back at her and hits a body avalanche against the ropes. Backdrop suplex by Matsumoto, and she gets the three count! Matsumoto wins the match and advances in the tournament. This match is in the Cinderella Tournament and has a 10 Minute Time Limit. Alpha Female has been on a quest to destroy all the other Freelancers in Stardom since returning (especially foreign ones), so this tournament match fits into her general goals. Queen Maya hails from Italy, we last saw her in Stardom in the FIVE STAR GP last summer. A classic Goliath vs. Goliath match. They start with a shoving match, they go into a Test of Strength until Maya knees Alpha in the stomach. Snapmare by Alpha and she clubs Maya in the chest, cover by Alpha but it gets two. Maya goes for a lariat but Alpha doesn’t go down, boot by Maya but Alpha hits a vertical suplex. Alpha picks up Maya and slams her to the mat, she charges her but Maya holds down the top rope and Alpha lands on the apron. Maya boots her back into the ring and picks up Alpha, but when she swings her around the referee is accidentally knocked out. Alpha puts Maya in an armtrap crossface, Maya taps but the referee is still out. Alpha looks at the referee, Maya has time to recover and she lariats Alpha over the top rope to the floor! Queen Maya wins the match and moves on the tournament. A flat match, partially intentionally because (spoiler!) these two are signed to have a match after this one happened so the feud isn’t over yet. I am never a big fan of the ref bump/wrestler doesn’t notice/loses due to being confused thing, I know they needed a way to get one of these two monsters to lose but it didn’t really work for me. Accomplished its goal of continuing their feud, but not a great match. This match is in the Cinderella Tournament and has a 10 Minute Time Limit. It is also the final match of the 1st Round. Io Shirai needs no introduction, she holds three titles, is the undisputed ace, and she holds the key to my heart. On the other side is Atenea, who is in her first tour with Stardom. And upward battle for the gaijin for sure, but anything can happen in the Cinderella Tournament. Shirai goes right at Atenea but Atenea kicks her off and hits a hurricanrana. Armdrag by Atenea but Shirai tosses her out to the apron, she tries to knock her to the floor but Atenea hits her back and flips into the ring. Tilt-a-whirl backbreaker by Atenea and she drops a few elbows onto Shirai’s back. Atenea puts Shirai in a submission hold but Shirai gets out of it and hits a double footstomp onto Atenea’s midsection. Back up they trade elbows, Atenea throws Shirai into the corner and swings her legs over the second rope before dropping her with an elbow. Atenea gets on the top turnbuckle and hits a body press, but it gets a two count. Atenea goes up again but Shirai avoids the senton, La Magistral by Shirai but Atenea gets a shoulder up. Running double knee by Shirai in the corner and she delivers the double underhook facebuster for two. Shirai goes for a suplex but Atenea elbows her off, Shirai hits a palm strike and this time she hits the German suplex hold for the three count! Io Shirai wins and advances. Not Io’s best match, but what I did enjoy was one small detail I thought was great – Shirai immediately tried to throw Atenea over the top rope to get the quick win. Everyone should have been doing that, but very wrestlers were, meanwhile the Ace that doesn’t have to was trying it to save her energy for the next two rounds. Sometimes it is the little things. Beyond that I thought the match wasn’t much above average, it never really felt like it got going as the shorter time wasn’t used as well here as it was in other matches. Not bad but it could have been better. Let’s get right to the next round in the Cinderella Tournament. This match is in the Cinderella Tournament and has a 10 Minute Time Limit. The rookie Kyouna got a nice win in the first round, but here she has a much bigger test as she faces one of the toughest wrestlers in Stardom. Kyouna attacks Matsumoto before she can even get into the ring, she leaves the ring herself (not over the top of course) and throws Matsumoto around on the floor. Kyouna throws Matsumoto into the ring post before hitting a body avalanche, she slides Matsumoto back in the ring and hits a series of elbows. Matsumoto comes back with her own elbows but Kyouna catches her with a powerslam for two. Kyouna goes up top and hits a diving body press, she picks up Matsumoto but Matsumoto blocks the lariat. Both wrestlers go for lariats, but Matsumoto sends Kyouna to the mat first. Sliding lariat by Matsumoto, and she picks up the three count! Matsumoto advances! This match is in the Cinderella Tournament and has a 10 Minute Time Limit. We roll on with Iwatani in a new role, as with Maya’s size and strength it is hard to look at Iwatani as the favorite here. 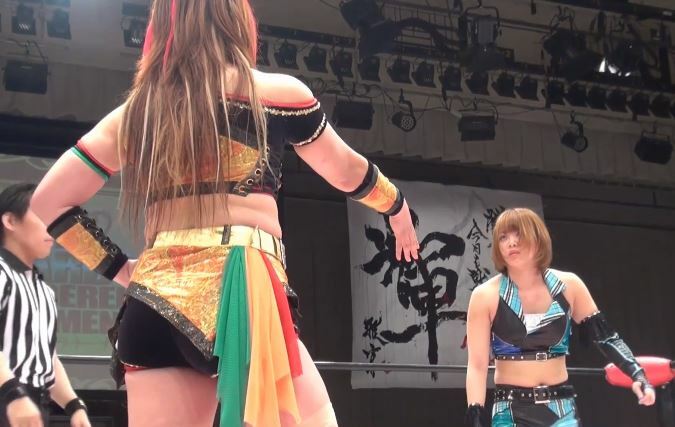 Iwatani does have success in Stardom recently but it hasn’t come against anyone of Maya’s size, and this is the first time they have ever faced off. Throwing her over the top probably won’t happen so Iwatani will have to find another way to beat Maya in under ten minutes. Maya wants to lock knuckles but Iwatani stomps on her foot instead, she slides away from Maya’s lariats but her elbows have no impact. Maya throws Iwatani against the ropes, Iwatani goes for a springboard move but Maya catches her and throws her to the mat. Maya goes for a chokeslam but Iwatani elbows out of it, slap by Maya and she tries to chokeslam Iwatani over the top rope but she lands on the apron. Iwatani kicks Maya over the top rope, she gets on the turnbuckle and hits a missile dropkick. Cover by Iwatani, but Maya quickly kicks out. Iwatani applies a sleeper but Maya flings Iwatani over her head to get out of it. Big chokeslam by Maya, she covers Iwatani but she is too cocky with it and Iwatani gets a shoulder up. Maya is mad, she picks up Iwatani and goes for another one, but Iwatani rolls her up for a two count. Quick crucifix pin by Iwatani before Maya can get up, and she picks up the three count! Iwatani wins and moves on to the next round. The best word I can use to describe this match is ‘effective.’ It did exactly what it was trying to do, the story was clear but it was told well, with Maya bringing the strength while Iwatani tried to find sneaky ways to win. Maya has a killer chokeslam and Iwatani sells everything like death anyway, I think if they had a bit more time they could put on a pretty solid match. It accomplished its goal, probably not a great match in a vacuum but it worked in a tournament setting. This match is in the Cinderella Tournament and has a 10 Minute Time Limit. Under normal settings this would be a big match, as Garrett doesn’t wrestle in Stardom often but since she has a belt, everyone wants to take her down. Hojo is attempting to turn her year around as she has been on a bit of a losing streak in singles matches, while Garrett wants to remind everyone why she is the Wonder of Stardom Champion. Hojo stomps on Garrett instead of shaking hands, she elbows Garrett down in the corner and delivers a Sliding D, but Garrett kicks out of the cover. Hojo goes for the Alabama Slam but Garrett blocks it, they trade elbows but neither gets an advantage. Monkey flip by Garrett and she holds down Hojo’s arms, but Hojo bridges out of the pin. Garrett throws Hojo into the corner and hits the Space Rolling Elbow, bulldog by Garrett and she covers Hojo for a two. Hojo comes back with a big spear, superkicks by Garrett and Hojo rolls out of the ring (under the bottom rope). Garrett gets a running start and sails out onto Hojo with a tope suicida (between the top and middle rope), she slams Hojo into the apron and slides her back in the ring. Vertical suplex by Garrett and she applies the Muta Lock, but Hojo gets a foot on the ropes. Garrett charges Hojo but Hojo moves, kick by Garrett and Hojo tries to run up the corner, but she slips. Hojo knocks down Garrett and tries again with a better result, as she hits a springboard elbow for two. Hojo applies a stretch hold but Garrett gets out of it, Final Cut by Hojo and she gets on the top turnbuckle, but Garrett recovers and hits her in the chest. Garrett goes for a headscissors but Hojo catches her and tosses her back to the mat. Hojo charges Garrett but Garrett gets her in a headscissors and tries to toss Hojo out of the ring. Hojo lands on the apron, Garrett goes to the apron also but Hojo kicks her so she is lying down on the apron. Garrett blocks the Sliding D attempt and tries to superkick Hojo off the apron, but Hojo hangs onto the ropes. She manages to get back in the ring, Garrett kicks Hojo in the head and covers her for two. DDT by Garrett, she goes for the Shining Star Press but Hojo grabs her leg and applies the Ikari. Garrett gets to the ropes, Hojo goes up top but Garrett avoids the diving elbow drop. Garrett goes for the cross armbreaker but Hojo wiggles to the ropes and forces a break. Hojo is up first and hits the spinning backfists, but the bell rings as time as expired. Both Hojo and Garrett are Eliminated from the tournament. I went into this round thinking this one could steal the show, but it was a bit of the opposite. Garrett and Hojo are both great wrestlers, no doubt about that, but they have no chemistry to speak of. Besides the obvious mistakes there were some other just really awkward moments where they didn’t appear to be on the same page at all. When they were in sync, the action was great, but they weren’t in sync the whole match and it is just more noticeable when a match isn’t terribly long. I think (and hope) they will have a better match next time, it wasn’t that the match was bad, it just wasn’t up to either’s normal standard and was overall a disappointment. This match is in the Cinderella Tournament and has a 10 Minute Time Limit. This is a fitting way to end this round, as these are two of the top wrestlers in Stardom but they very rarely face off. In fact, they haven’t had a singles match since 2013, when Kimura challenged for Shirai’s World of Stardom Championship. Course this is a different situation, with the tournament rules in place, and both showed in the first round they will do anything to win as quickly as possible. They start slow with wristlocks but things go up a notch as Kimura flings around Shirai by her hair. Shirai quickly rolls up Kimura for two, she hits a German suplex hold but it gets the same result. Kimura rolls out of the ring under the bottom rope, Shirai goes to do a dive but Act spits Sake at her from the apron before he can complete the dive. Kimura pulls Shirai out of the ring and throws her into a row of chairs, as the other members of Oedo Tai help. Back in the ring, Kimura gets a metal rod while Kagetsu comes into the ring and throws Shirai at the referee when his back is turned. Kagetsu hits Shirai with a bat, they both go off the ropes and boot Shirai in the chest. Kagetsu goes up top while Kimura picks up Shirai, and they both slam Shirai to the mat as the referee finally recovers. He gets Kagetsu out of the ring before starting his count, and Shirai gets a shoulder up. Kagetsu returns but Shirai backflips past them and dropkicks both out of the ring. She then goes out to the apron, Act runs over but Shirai boots her to the floor before hitting a moonsault down onto Kimura and Kagetsu. Shirai rolls Kimura back in and hits the swandive missile dropkick, Tiger Feint Kick by Shirai and she goes up top, nailing the Rider Kick! Cover, but Kimura gets a shoulder up. Double underhook facebuster by Shirai, she goes for a moonsault but Kimura gets both feet up. Back up, elbows by Kimura but Shirai snaps off a hurricanrana for two. Big boot by Kimura and she headbutts Shirai, covering her for a two count. Kimura tries to throw Shirai over the top rope but they both end up on the apron, where someone has set up a table on the floor nearby. They both walk onto the table, Kimura chokebombs Shirai onto the table which causes it to break and both crash to the floor. Kimura tries not to touch the floor in the process, but the referee says they hit the floor at the same time. Shirai and Kimura are both Eliminated. Because two of the last four matches ended with both wrestlers being eliminated, there is no Semifinals as only Iwatani and Matsumoto survived the Quarterfinals. So we are going straight to the Finals, with Mayu Iwatani vs. Hiroyo Matsumoto! This match is the Finals of the Cinderella Tournament and has a 30 Minute Time Limit. Over-the-top rules are still in effective. Not to toot my own horn, but in my Predictions I had these two with the best and third-best odds, so I think overall my prediction was pretty solid. Matsumoto being here is no surprise regardless, as she is the top Freelancer that Stardom uses and is incredibly difficult to beat. Iwatani won last year’s Tournament and holds two titles, however still is not really the favorite here, it is a very even match-up. The winner of this match gets to wear the pretty dress and is granted one wish (likely a title challenge). Iwatani won’t shake Matsumoto’s hand before the match and attacks her from behind, looks like Iwatani isn’t in the mood to place nice today. Iwatani avoids Matsumoto in the corner and hits a high kick followed by a spinning headscissors and a dropkick while Matsumoto is against the ropes. Iwatani hits the dragon suplex hold, but Matsumoto barely gets a shoulder up and rolls out of the ring. Iwatani goes up to the top turnbuckle but Matsumoto throws a chair at her, she then gets up on the apron and powerbombs Iwatani onto the apron. Iwatani flops out to the floor (she had gone under the top rope to get to the turnbuckle, so this did not eliminate her), Matsumoto goes after her and tosses her around at ringside. Matsumoto takes Iwatani up onto the stage and hits a backbreaker, she picks up Iwatani and throws her off the stage onto some of the Stardom rookies. They finally return to the ring, Matsumoto puts the dinosaur mask on Iwatani’s head and hits a body avalanche in the corner. Hilarious visual. Matsumoto goes up top and hits a missile dropkick, cover by Matsumoto but it gets two. Matsumoto puts Iwatani on her shoulders and applies a backbreaker, but Iwatani gets out of it and elbows Matsumoto. Kick by Iwatani but Matsumoto hits a hard elbow, crucifix bomb by Iwatani but Matsumoto kicks out. Iwatani gets on the second turnbuckle and hits a diving footstomp, she hits another one and covers Matsumoto for two. She goes up top a third time but this time Matsumoto recovers and joins her, as she goes to the well one too many times. Iwatani jumps off the top and grabs Matsumoto from behind, and she hits a release dragon suplex. Iwatani goes up top and goes for a body press, but Matsumoto gets her knees up. Matsumoto is up first and nails a powerbomb before putting Iwatani in an elevated crab hold. Iwatani gets to the ropes, Matsumoto picks up Iwatani and drops her with a gutbuster. Knee by Matsumoto and she goes off the ropes, but Iwatani catches her with a superkick. Two more superkicks by Iwatani but Matsumoto turns her inside out with a lariat. Iwatani slowly gets up near the ropes, Matsumoto charges her and lariats Iwatani onto the apron. Matsumoto tries to kick her off to the floor but Iwatani hangs onto the ropes, Matsumoto charges Iwatani but Iwatani flips over the top rope and hurricanranas Matsumoto onto the apron with her. Both wrestlers get up on the apron, having both gone over the top rope so if either fall to the floor they lose. High kick by Iwatani but Matsumoto blocks the headscissors attempt. Iwatani gets back in the ring as Matsumoto tries to hang on, dropkick by Iwatani and Matsumoto falls to the floor! Iwatani has won the match and is the winner of the 2016 Cinderella Tournament for the second straight year! Post match, Iwatani goes to the back and puts on the Cinderella dress. She gets on the microphone and announces she is using her wish to challenge Io Shirai for the World of Stardom Championship, which was expected. Io Shirai and other wrestlers take their turns on the microphone, then Yoko Bito comes down! Yoko Bito was a former Stardom wrestler that was forced to retire due to injuries back in 2012, you can read more about her here. 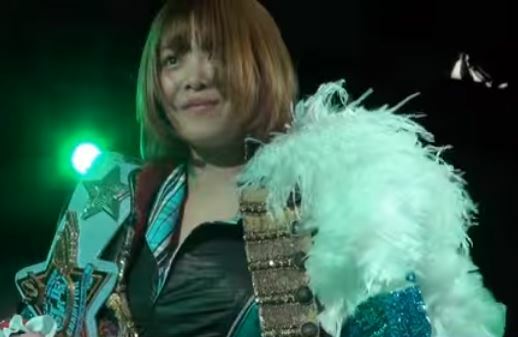 She announces her return to Stardom as the crowd roars, so we end the event with two title matches set up for next month (Io Shirai vs. Mayu Iwatani and Kairi Hojo vs. Santana Garrett) and the return of Yoko Bito to Stardom. The Cinderella Tournament is a very unique experience, but its an enjoyable one as long as you know what you are getting into. Having a 16 wrestler tournament where every match has a 10 minute time limit leads to a ton of short matches, but if you are into sprints then you will really like it. Not all of the pairings went great, but the majority of the matches were at least fun and the main event told a great story. From top to bottom an easy show to recommend, it won’t have any MOTYC matches but was a blast to watch with some nice surprises and a satisfying conclusion.